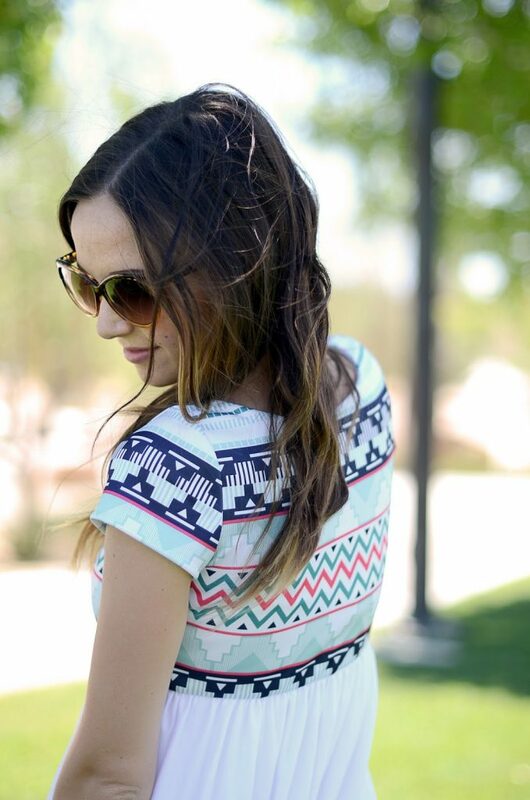 A few weeks ago, SheInside sent me a darling aztec print skirt. I was super excited to receive it because I loved the print, and I knew it would be perfect for summer. Also, I have a deep love for stretchy pencil skirts. So when it arrived and I could barely squeeze my birthing hips through that little tube of fabric, I was bummed. It sat in my room for a few days until I was looking through my sewing inspiration pinterest board and saw this dress from Kendi. I’d been planning to go out and hunt for a good geometric print fabric for the top part of the dress, but it turned out I already owned the perfect fabric! So I chopped up that pretty little skirt and turned it into a dress. Also, I have to mention that Philip and Leanne gave me a mat, rotary cutter, and straight edge for my birthday, and it has revolutionized my sewing. Not only are my projects going faster, but it’s easy to make patterns with parchment or pattern paper and then my clothes actually fit the first time without a zillion alterations and fittings. It’s a miracle. If you don’t own those sewing essentials, go get them. Go now. Step 1. If you’re using a skirt, first unpick the side seams, hem, and waistband. Using a tank or tee as your guide, cut a piece of parchment or pattern paper to create the pattern for the bodice of the dress. 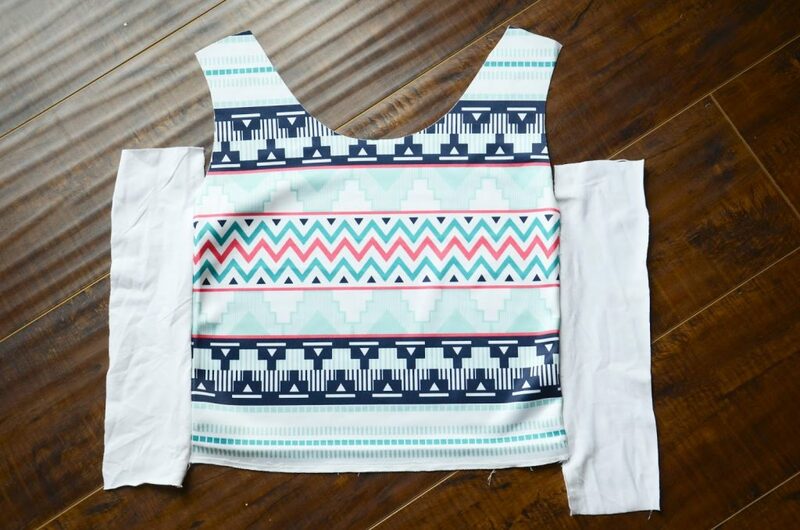 Fold the paper in half to make sure the sleeves and neckline are symmetrical and straight. 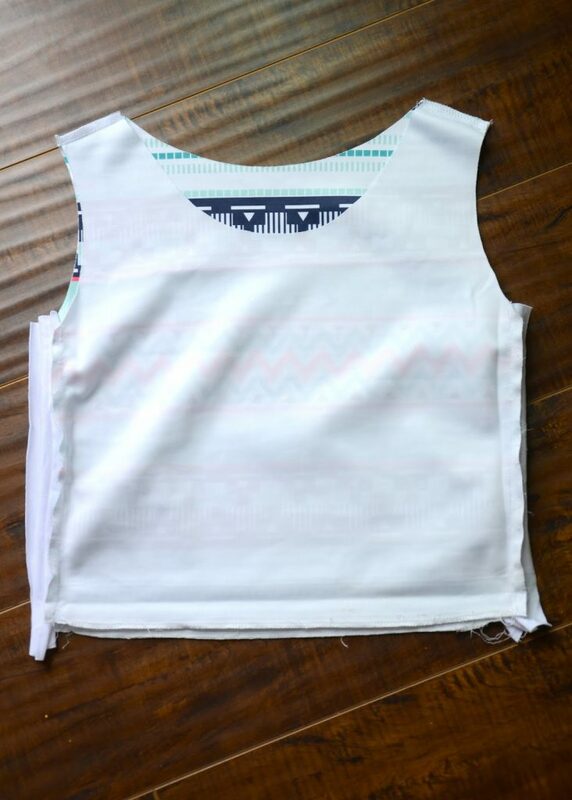 Now that you have your pattern piece, use it to cut the bodice of your dress, cutting TWO identical pieces. You should now have two matching pieces, one for the front, one for the back. 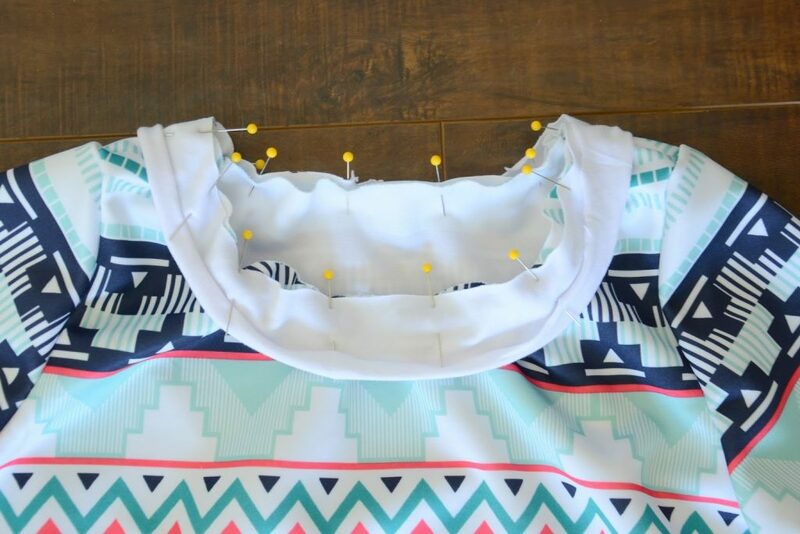 Cut the neckline to your desired depth on the FRONT piece. Step 2. 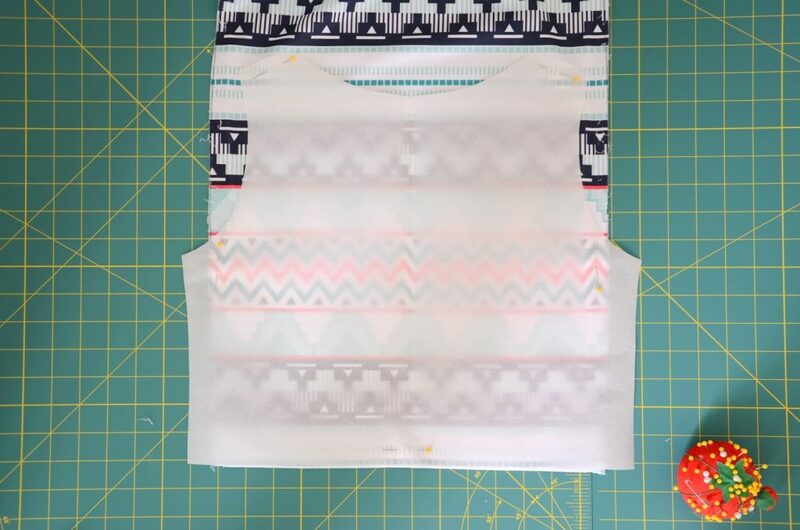 To add width on the sides, determine how much extra room you need and then cut two strips of jersey knit, as wide as you need it, and long enough to extend past the waistline and armpit, as seen below. With right sides together, attach them to the FRONT piece with a straight stitch. Trim the seam allowance. Step 3. With right sides together, sew up the shoulder seams and the sides, as seen below. Step 4. Next, let’s do the sleeves. 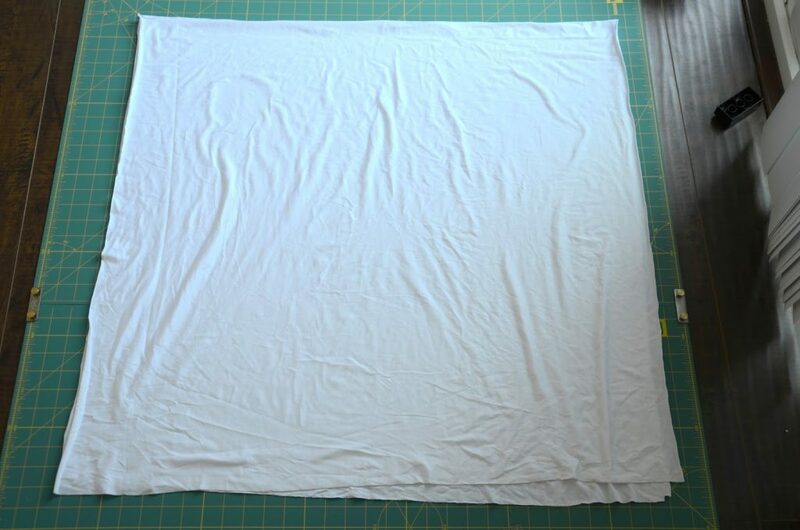 Cut two sleeves from your fabric, as seen below. (Not pictured): with right sides together, sew up the short straight sides to make the sleeve. Then with right sides together, insert the sleeve into the armholes of the bodice, pin, and then sew around the armhole with a straight stitch. Repeat with second sleeve. Step 5. Now that your sleeves are attached, let’s finish the neckline. Cut a 2″ wide strip of jersey knit that is long enough to reach around the entire neckline. Trim off roughly two inches (so it’s 2 inches shorter than the circumference of your neckline), and then sew the short ends together so you have a circle of fabric. Then with right sides together, pin it to your neckline, stretching the jersey knit as you go so it goes all the way around then neckline. 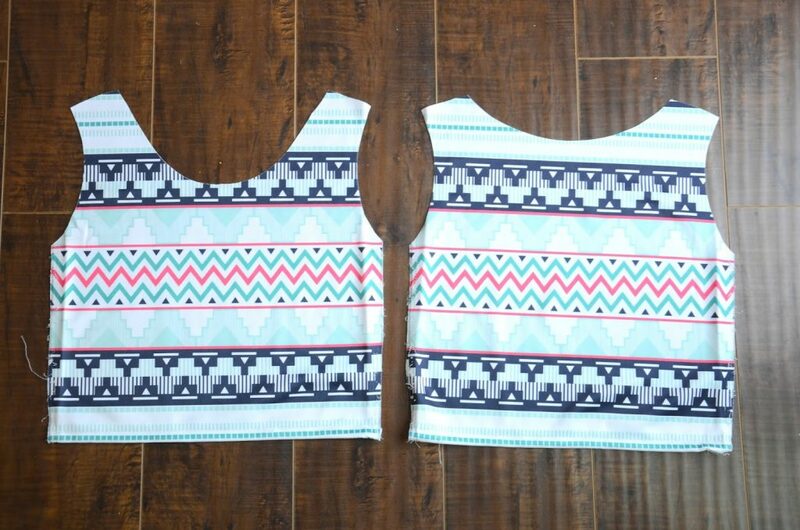 Sew with a straight stitch around the neckline. 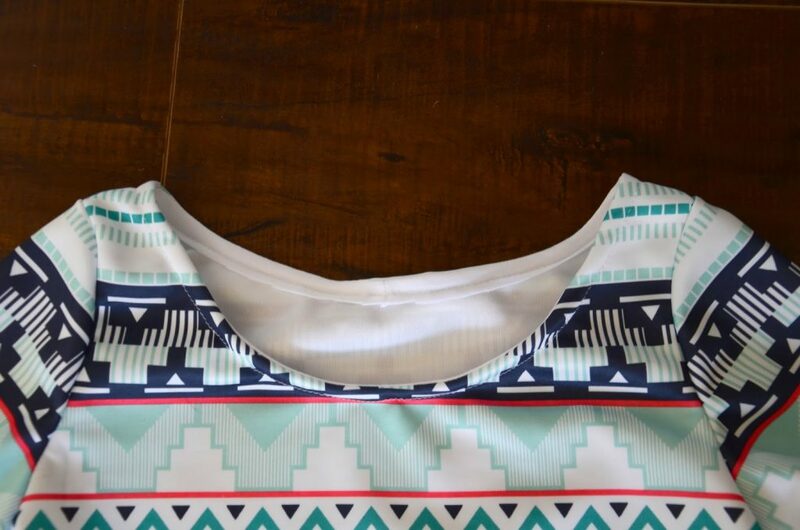 Tuck the jersey knit fabric inside, and then sew around the neckline again with a wide stitch, as seen below. Then trim the extra jersey knit fabric. Step 6 (Not pictured). Determine your desired length of sleeve, and then hem the sleeves. Step 7. Now let’s move to the skirt. Measure around your ribcage, just below your bust. Cut TWO identical squares of the lightweight jersey knit fabric with that measurement as the width, and then your desired dress length as the length, as seen below. Both FRONT and BACK piece of the skirt will be as wide across as your entire ribcage measurement, which will allow for gathering. Sew up the sides. Then do a basting stitch around the entire waistline, and pull the long strings to gather the waist. Gather until the waist opening is the same circumference as the opening on the bottom of your bodice. 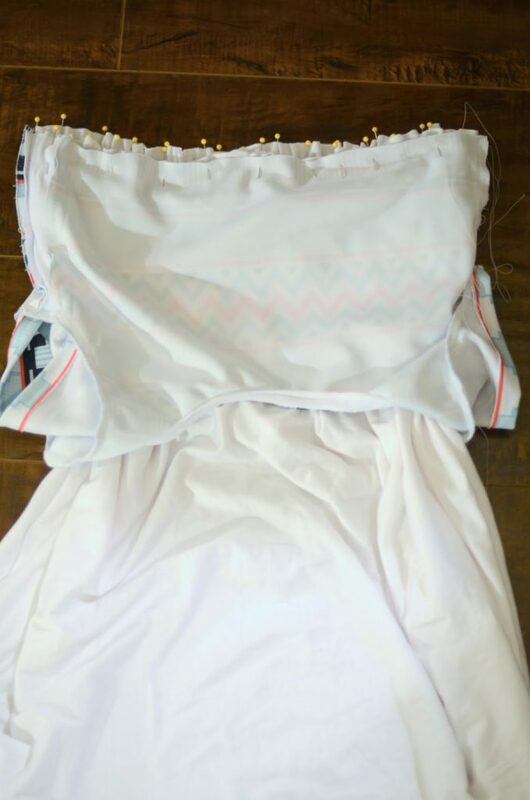 With right sides together, pin the gathered skirt to the bodice, as seen below. Trim your seam allowance (to avoid a bulky seam right under your bust). Try your dress on and determine your desired length, then hem your dress and you’re done! Wow! What a fantastic alteration! I have never thought of doing this with a skirt that is too tight. And I'm sure after birthing my hips may not fit into a few of mine. Nice to know I have an alternative if needed. You are so fantastic at finding inspiration everywhere. I absolutely love this. It's adorable and I love how modest it is! I in awe. You are truly talented!! What a great idea to not let a cute skirt go to waste. I don't sew much beyond the occasional hem, but I have noticed when I sew with jersey or any fabric with some stretch normal thread seems to rip when I put the clothes on and off because the fabric stretches but the thread does not. Do you use a special thread or special stitch or something? Using a double needle for hemming allows for some stretch, so I'd recommend that. And if I hadn't added elastic to the waistband, the threads would break just like you mentioned. So maybe try that in the future! I LOVE that little dress. And you make it sound so easy! I definitely need sewing lessons. This is so cute! I'm intimidated to sew knit fabric. Do you use a special needle and/or foot? I use a ball point needle — it's a special needle for sewing with knits. Since I've switched to that (a few years ago), I haven't had any trouble with sewing knits, where before with a regular needle my fabric was constantly bunching or catching. And no, I just use a regular foo! Amazing!! I wish I could sew… all I have mastered is pillow covers and a pair of baby leggings:) I think I've got a ways to go! No, I didn't go…I just couldn't fit it in with both of my kids! But Leanne from Elle Apparel went and she said it was pretty fun, and that Diane, the owner, was great! Freaking GENIUS! That skirt is/was ADORABLE! I'm glad you were able to make use of it! Love this as well as all of your other tutorials!! Absolutely love the way this dress turned out; the print is too cute! I love this dress much! So wish I could sew! 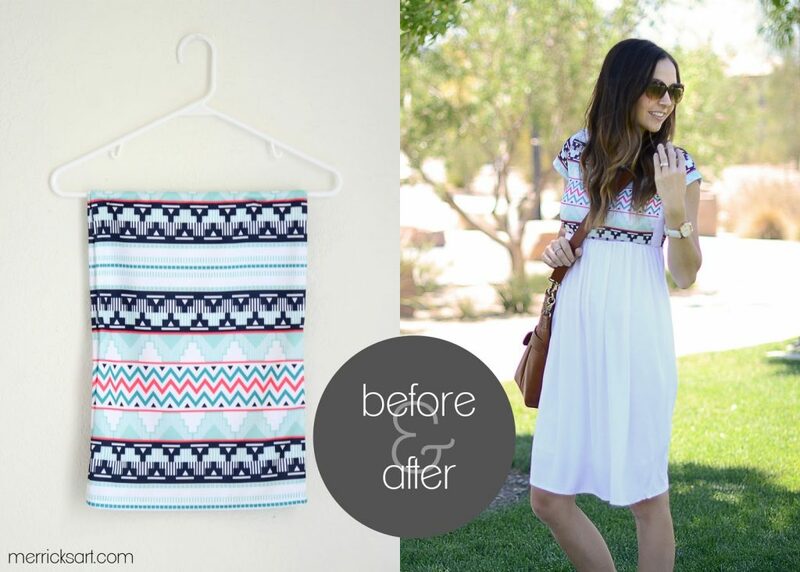 I LOVED that dress of Kendi's and I'm so glad you made a tutorial for it! This is the best! This is SO cute! Thanks for sharing the tutorial! 1. I love the fit of this dress! I'll have to remember it for after-baby body. 2. I canNOT believe you've been doing all this sewing without a rotary cutter! If I tried to use scissors all the time my stuff would be a mess! I bet it was life changing. 3. Maybe you've already posted about this, or maybe it's too awkward, but do you have tips for what to wear under those stretchy pencil skirts?? I never buy stretchy skirts because I hate underwear lines. 1. Thank you! And it's totally maternity friendly with the empire waist! 2. I know…I was living in the dark ages! It has absolutely been life changing! 3. I haven't posted anything on that subject. I'm LDS and married in the temple, so I don't wear regular underwear and therefore don't have to worry about those underwear lines. Maybe try the kind from Victoria's Secret that are super thin and are supposed to have no underwear lines? Or maybe try some boy short length ones?? Sorry — totally not helpful on that subject! 🙂 Good luck! I'm literally about to dig in my closet to find some fabric to do this! Thanks for the inspiration! I'm so grateful I was taught to sew at a young age! Lemonade!!! Not that the fabric was a lemon, just the size of the skirt. I pinned this to share the inspiration. That's an awesome pattern. I love your new dress. This is such a cool idea! I need to get back to practicing sewing. omg this dress is so cute! How adorable – you did such a great job on this! Oh So cute!! Fantastic job! I would love, LOVE, LOVE for you to link this up to our blog hop if you get a chance. It goes live at 8pm. CST. Thanks! Merrick- This turned out so adorable. 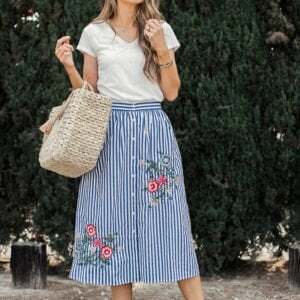 The skirt fabric is to die for! So so so cute! I love how you turned this into a dress. 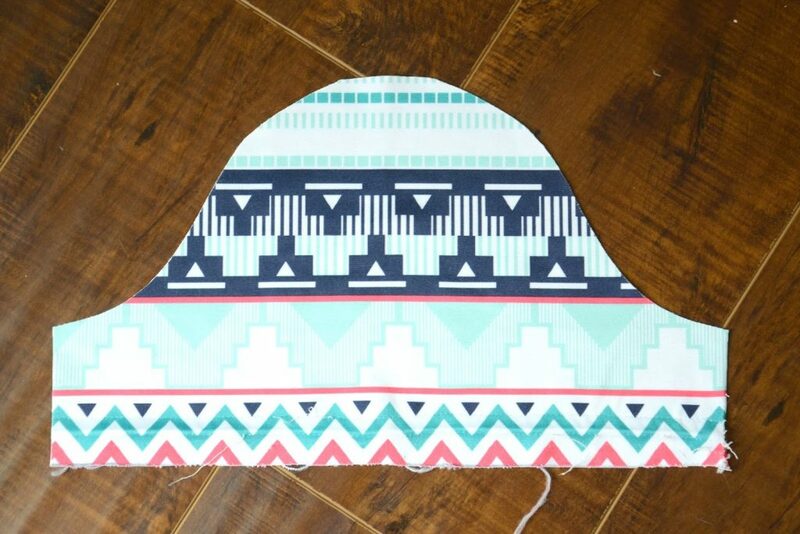 I want to try it out now– you are always inspiring me to try more things with my sewing machine! Wow! This is why I need to learn to sew. I saw kendi's dress and though I loved it, I knew it would be way too short for me. This is a perfect length and nearly impossible to find in stores. I must learn your ways. That looks great! I keep pinning your tutorials in the hopes that I'll finally get around to trying one, but it still hasn't happened. I'll be sure to share the results once I do though! 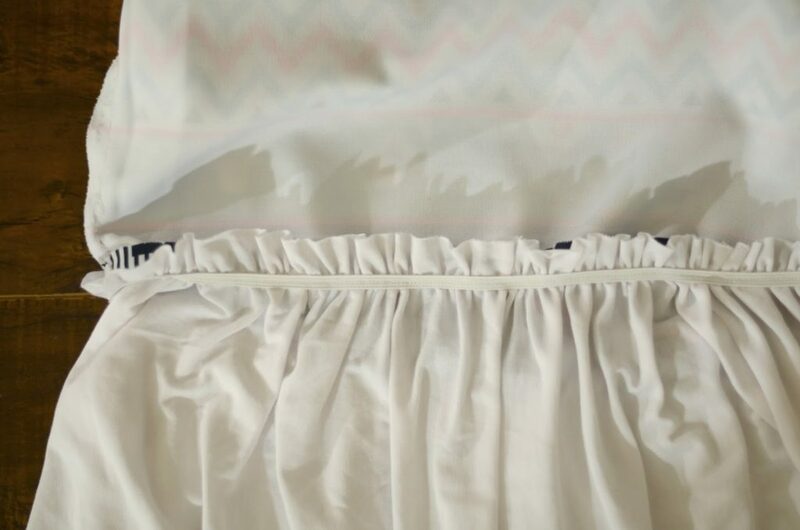 I have a question: would it be possible to do that whole add fabric to the sides of the top/old skirt for an entire skirt itself? I have a skirt almost EXACTLY like that one that fits perfectly everywhere but in the waist band, and I want to make it work so bad. Any suggestions? I don't want the whole skirt to be baggy by adding width everywhere, but I don't like the tight feeling. Also, the skirt is supposed to fit around the waist, but I like it around the hips. Do you think it would work to somehow cut it (since it's long enough because it goes at the waist) and attach a band around a wider part of the skirt?